We love having parties and for each party we have, I create lovely jello shots. I never repeat the same shot, because the possibilities are endless. I love Amaretto on the rocks and amaretto sours, one of the few boozy drinks I will actually indulge on. Set apart from those I am a wine and margarita kind of gal. 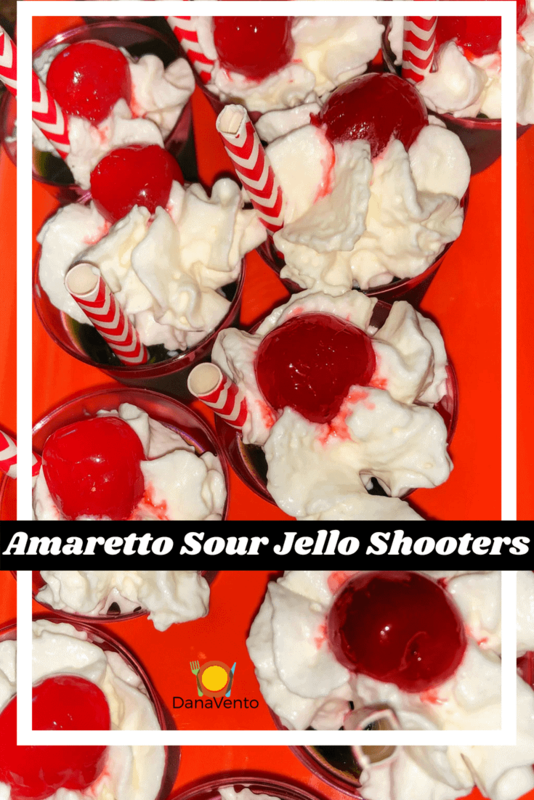 Our party over the weekend consisted of many libations, but the Amaretto Sour Jello Shots stole the show. Personally, I believe alcoholic drinks are all about presentation. Anyone can pour wine into a glass and serve it, but receiving Sangria with beautiful fruits and color is certainly more appealing. IN a like manner, consider your boozy drinks and jello shots. Do you really just want a jello shot or do you want a jello shot creation? Lavishly live amaretto sour jello shots out loud. 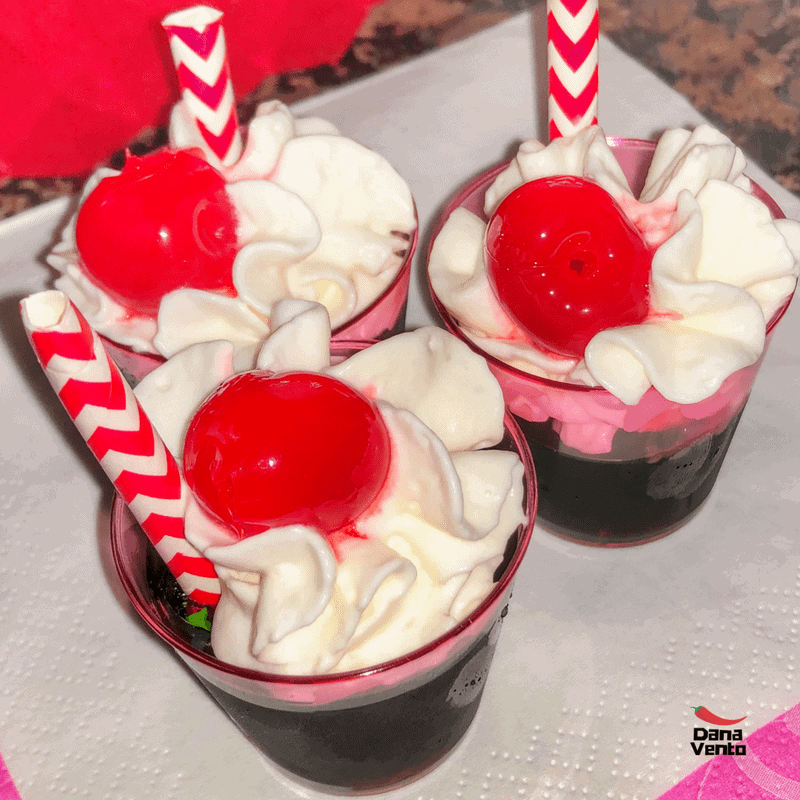 Use this recipe to create fantabulous jello shots that will not only appeal to the eye, but to the taste buds as well. Ready? Set? S-H-O-O-T-E-R-S! *Never drink and drive, do not drink if you are pregnant or think you might be pregnant and drink responsibly if you do drink – Must be of legal age to consume alcohol. Friends don’t let friends drink and drive. I am not advocating drinking, but I am giving those of you who love their special drinks a new recipe! Honestly, there are so many recipes for jellos shots vying for your attention, but they are not all the same. For me, it is about easy to recreate recipes and ingredients that everyone can find. I don’t believe in making something harder than it needs to be. I am a boil it, stir it, let’s be done with kind of gal! 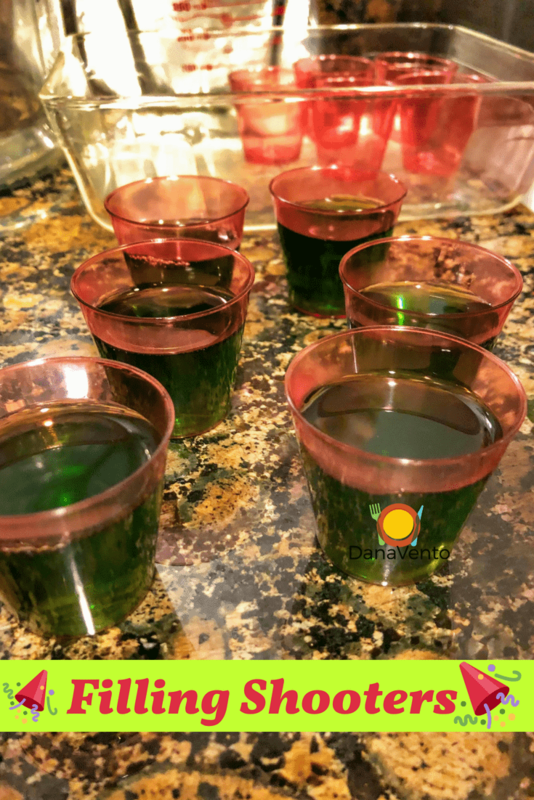 When I initially posted a pic of the jello shots, I got a few people asking, “Hey weren’t Jello Shots so 90’s?” Or another person asking, “really Jello Shots are still a thing! ?” Yes and Yes! However, these are not frat house jello shots! Your job in the Amaretto Sour Jello Shots is to dress these little shot glasses up. Everyone will want what they see. Setting jello shots apart from ‘yesteryear’ is easily done when you know how to make a difference. Let’s get rid of simple shot glasses and deck out the shot with more taste than anyone will expect! Don’t these look spectacular? Read on for the how-to and recipe. Certainly, you can see these look better than just those basic shot glasses and jello, so let’s create. It’s easy, I promise you! First things first, while I am a snob about my amaretto when I am drinking it on the rocks, or as part of an amaretto sour, I am not a snot when pouring it into Jello. At this point, I will say Amaretto is Amaretto. Point being, when you head to purchase Amaretto, do not worry about what brand you buy. Rather, purchase whatever is in your budget! You can make this with lemon or lime gelatin, to be honest. I, however, have done this 2 different ways and hands-down prefer lime. There is just something about the tart of the lime against the sweet of the amaretto that makes this the better pairing relationship, IMO. What the eyes see translates into what the belly wants. Now if you have done the drink correctly, your eyes will send a strong signal to the belly, and you will so crave this little shot glass. If you have done this badly, it will look like a frat drink. Paper Straws are your friend for this drink. 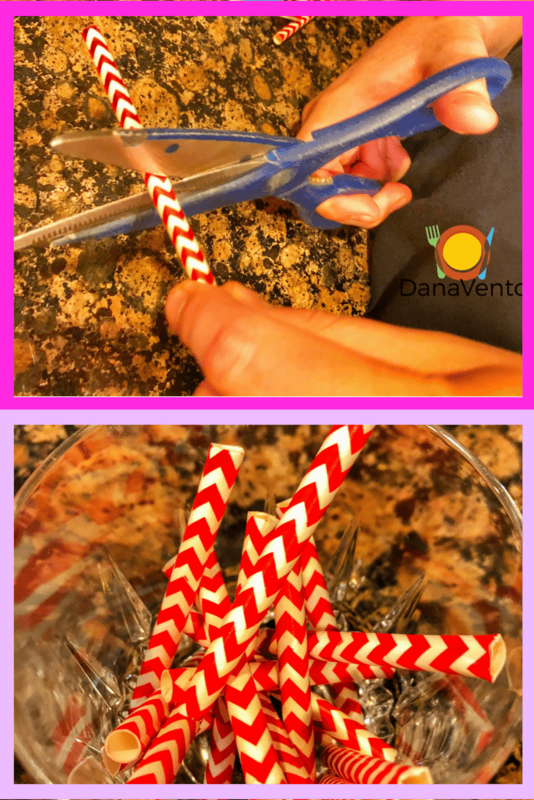 Make sure to find brilliantly colored paper straws. Remember, our journey is to get this look! I want to eat these through the screen, do you? I mean, they look really refreshing and so cute in those little shot glasses. Would you suspect these to be loaded with Amaretto? They are! Let’s Get Boozy Shall We? Remember to bookmark this page, pin it and share it, you can thank me later! 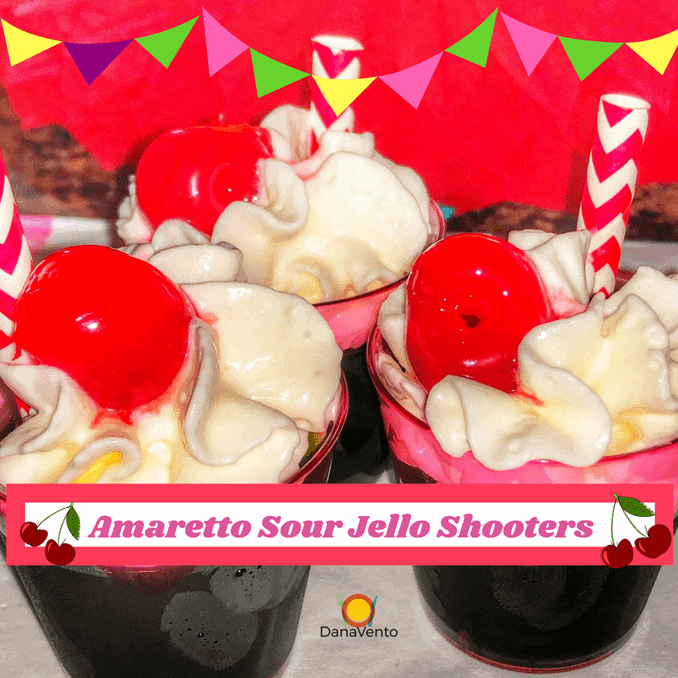 Gather the ingredients so you can have your Amaretto Sour Jello Shots ready in just a few hours, yes it is that easy! Remember, I do not put anything on my site that can not be easily replicated. I am the master of fast and easy to master recipes, yet, everything looks great when its done! Party time about to commence and please feel free to taste test as you do this! Bring water to a boil. While you are waiting for the water to boil, open the gelatin, and pour into mixing bowl. Once the water has come to a boil, remove from heat and pour onto powdered gelatin. Stir very well, making sure to dissolve the powder. Now add in lemon juice and stir well. Last, add in the Amaretto and stir again. Place 24 plastic, disposable shot glasses on a tray (very important because you do not want to move these again). Fill each glass 3/4 full. Last you will refrigerate these for at least 4 hours or overnight, your choice. Truly dependant on how fast you need them. The plain and the ugly, are what these are. Take a look, I mean these are frat style jello shooters, and I say, “really?” No one serves basic at a party, dress the sucker up! To me, it looks like little jello cups, that don’t scream try me. I want them to be eaten, sucked down, enjoyed and beautiful, I want them to look like this! Ready? Then I will show you how! These look like little floats right? So back to basics, let’s see how to get ‘er done. Simple to follow instructions for assembly. I mean literally, not even a minute to complete about 4 at a time! Which means that if you can do 4 per minute or more, the party can start fast! Woot! 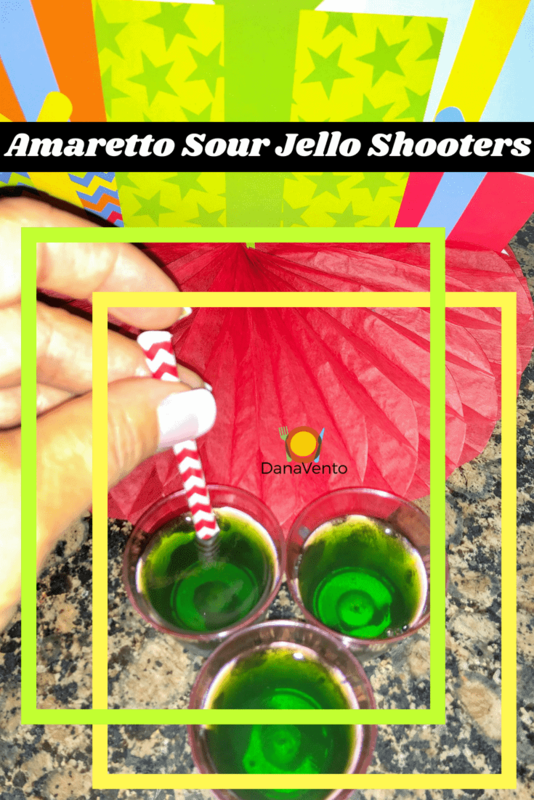 When it is time to serve the Amaretto Sour Jello Shots, there are a few things to do to make your jello shot more than a frat party shot presentation. This is all about the look and trust me, they are so darn cute and really delicious and refreshing! The straw positioning is key to loosening that jello shooter so get it in right! First, add your paper straw to each. Then it’s time for the whipped topping (don’t’ forget to sample, lol!). Doesn’t it look so yummy already, like mini drinks right? Except these are not drinks, they are jello shooters and the delivery is smoother and more fun than a traditional drink. Now no dessert is complete without a cherry on top right? So what are you waiting for? Make sure to print the recipe below so that you can make these over and over again with new ingredients. Like I said, change up the jellos, the toppings, the glasses, never do the same but keep the basic recipe! It’s a blast every time I make them. Now it’s time to say, “Shooters” and loosen the edges with the straw and let it slide on down! While you are waiting for the water to boil, open the gelatin, and pour into mixing bowl. Once the water has come to a boil, remove from heat and pour onto powdered gelatin. Stir very well, making sure to dissolve the powder. Now add in lemon juice and stir well. Last, add in the Amaretto and stir again. Place 24 plastic, disposable shot glasses on a tray (very important because you do not want to move these again). Fill each glass 3/4 full. Last you will refrigerate these for at least 4 hours or overnight, your choice. Truly dependent on how fast you need them. Previous Post: « Which Hyundai Is Best For Your Family? GREAT POST!!! These look soooooooo gooooood!!!! I am definitelty going to make these at my next party! I look forward to reading many more great articles on your website. Thanks again for the great share!